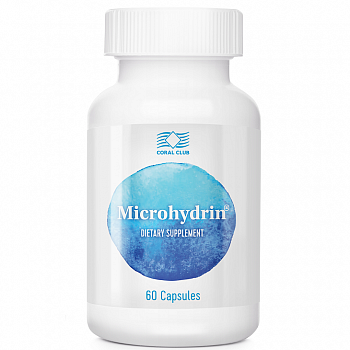 “Microhydrin” – is a powerful antioxidant that actively destroys free radicals. The product enhances endurance, performance, and immunity. “Microhydrin” boosts energy and improves the supply of nutrients to cells. The product promotes better absorption of nutrients, improves muscle flexibility and tone, and prevents premature aging. Begin with one capsule daily for 2 days and then increase to one to two capsules twice daily or as otherwise directed by a healthcare professional. Microhydrin should always be taken with an 8 ounce glass of water. This proprietary mineral blend (Potassium carbonate, magnesium ascorbate, potassium citrate, silica, purified-ionized water, calcium hydroxide, mannitol, magnesium sulfate, citric acid, sunflower seed oil) acts as a very powerful antioxidant.